Workplace Diversity: Is National or Organizational Culture Predominant? Download "Workplace Diversity: Is National or Organizational Culture Predominant?" 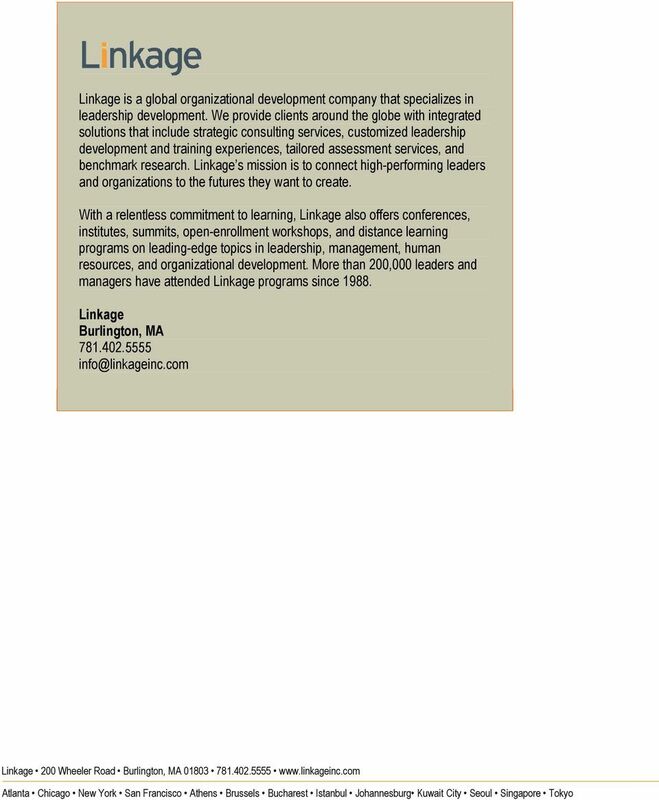 1 THE LINKAGE LEADER Workplace Diversity: Is National or Organizational Culture Predominant? By Ashley M. Guidroz, Lindsey M. Kotrba, and Daniel R. Denison Ashley M. Guidroz, PhD is a member of the Research and Development team at Denison Consulting. Dr. Guidroz conducts research on the effect of organizational culture and leadership behavior on business performance, particularly focusing on workforce diversity. Recent research has focused on how organizational culture can be used to better integrate diverse employees, as well as looking at gender differences in leadership behavior and effectiveness. Lindsey M. Kotrba, PhD, is the director of Denison Consulting s Research and Development team. Dr. Kotrba works to maintain Denison s strong research focus. She is involved in analyzing and managing client databases, preparing articles for publication, and presenting research and case studies in the areas of organizational culture and leadership. Dr.Daniel R. Denison, PhD, is Professor of Management and Organization at IMD in Lausanne Switzerland. Previously, Dr. Denison was an Associate Professor of Organizational Behavior and Human Resource Management at the University of Michigan Business School. 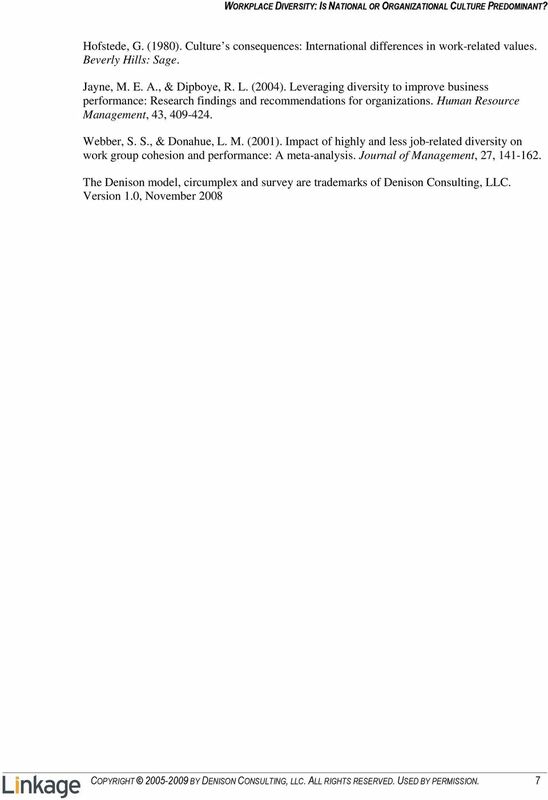 Dr. Denison published the Denison Organizational Culture Survey and the Denison Leadership Development Survey. These surveys and the underlying models have been used by over 5,000 organizations worldwide. Copyright Denison Consulting, LLC. All rights reserved. Used by permission. 2 With increasing attention directed at the importance of workplace diversity, organizations are faced with the daunting task of effectively managing the diversity they have. For a variety of reasons, diversity and diversity management practices have become more prevalent in workplaces across the globe. 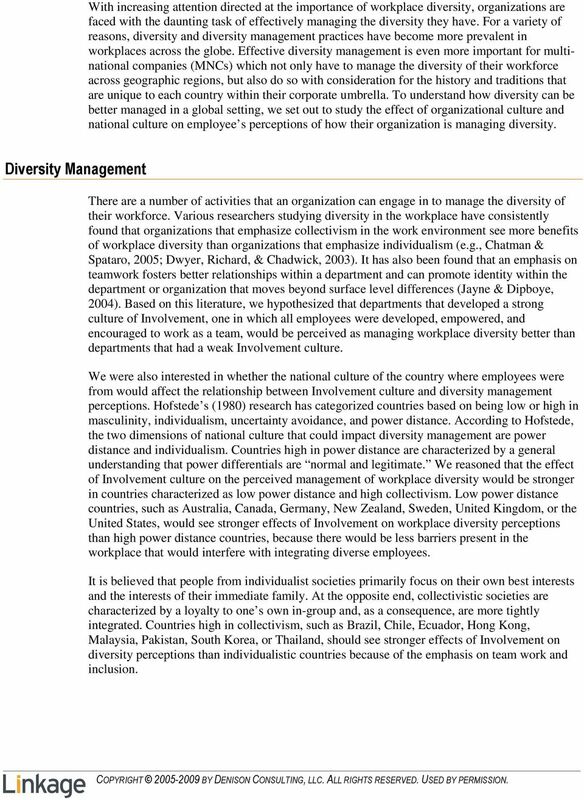 Effective diversity management is even more important for multinational companies (MNCs) which not only have to manage the diversity of their workforce across geographic regions, but also do so with consideration for the history and traditions that are unique to each country within their corporate umbrella. To understand how diversity can be better managed in a global setting, we set out to study the effect of organizational culture and national culture on employee s perceptions of how their organization is managing diversity. Diversity Management There are a number of activities that an organization can engage in to manage the diversity of their workforce. Various researchers studying diversity in the workplace have consistently found that organizations that emphasize collectivism in the work environment see more benefits of workplace diversity than organizations that emphasize individualism (e.g., Chatman & Spataro, 2005; Dwyer, Richard, & Chadwick, 2003). It has also been found that an emphasis on teamwork fosters better relationships within a department and can promote identity within the department or organization that moves beyond surface level differences (Jayne & Dipboye, 2004). 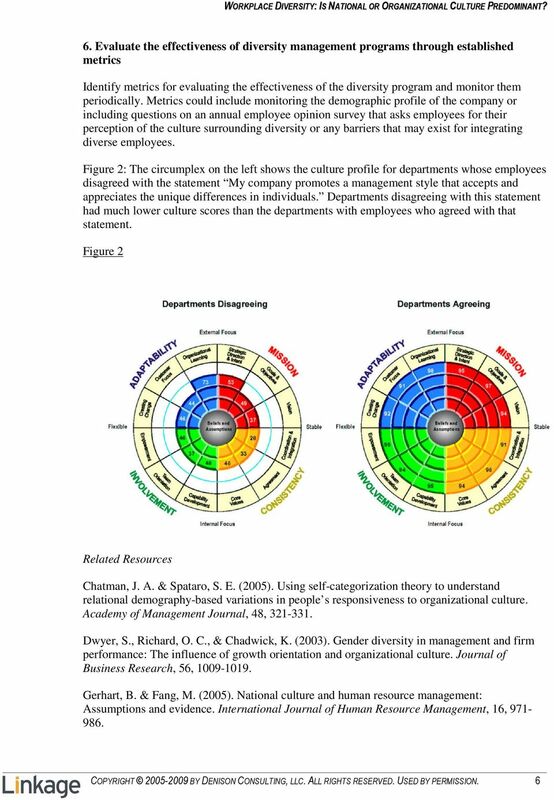 Based on this literature, we hypothesized that departments that developed a strong culture of Involvement, one in which all employees were developed, empowered, and encouraged to work as a team, would be perceived as managing workplace diversity better than departments that had a weak Involvement culture. We were also interested in whether the national culture of the country where employees were from would affect the relationship between Involvement culture and diversity management perceptions. Hofstede s (1980) research has categorized countries based on being low or high in masculinity, individualism, uncertainty avoidance, and power distance. According to Hofstede, the two dimensions of national culture that could impact diversity management are power distance and individualism. Countries high in power distance are characterized by a general understanding that power differentials are normal and legitimate. We reasoned that the effect of Involvement culture on the perceived management of workplace diversity would be stronger in countries characterized as low power distance and high collectivism. Low power distance countries, such as Australia, Canada, Germany, New Zealand, Sweden, United Kingdom, or the United States, would see stronger effects of Involvement on workplace diversity perceptions than high power distance countries, because there would be less barriers present in the workplace that would interfere with integrating diverse employees. It is believed that people from individualist societies primarily focus on their own best interests and the interests of their immediate family. At the opposite end, collectivistic societies are characterized by a loyalty to one s own in-group and, as a consequence, are more tightly integrated. Countries high in collectivism, such as Brazil, Chile, Ecuador, Hong Kong, Malaysia, Pakistan, South Korea, or Thailand, should see stronger effects of Involvement on diversity perceptions than individualistic countries because of the emphasis on team work and inclusion. COPYRIGHT BY DENISON CONSULTING, LLC. ALL RIGHTS RESERVED. USED BY PERMISSION. Executive Coaching: Does leader behavior change with feedback and coaching? ORGANIZATIONAL CULTURE & EMPLOYEE ENGAGEMENT: WHAT S THE RELATIONSHIP? Cultural dimensions describe the effects of a society's culture on the values of its members, and how these values relate to behavior. IS YOUR COMPANY'S CULTURE HELPING OR HINDERING? Dell x86 servers earn top overall customer satisfaction in 4Q14 May 2015 TBR T EC H N O LO G Y B U S I N ES S R ES EAR C H, I N C.
Identifying talent in a crowded and complex market is an art as well as a science. 12-ICIT 9-11/4/07 in RoC Going for Gold ~ Best Practices in Ed. & Public Paper #: 07-08 Page- 1 /7 Challenges of Intercultural Management: Change implementation in the context of national culture Prof.
STRATEGIC PLAN 2015 FUTURE. ENVISIONED. Health Insurance. Perception & Reality. Salman Rawaf MD PhD FRCP FFPH. Professor of Public Health Erbil Iraq 2-4 Feb 2011 s.rawaf@imperial.ac.